OVERVIEW: The FG JR2 is a great starter guitar for kids ages 7 to 11. Yamaha is known for its quality instruments, and this model is no exception, not only is it incredible value for the price you are paying, the sound is excellent. The 3/4 size makes it a solid option for kids who are just learning to play and need something that fits them well. Yamaha offers a couple of really great options for kids in the 7-11 year age range, one of these models is the Yamaha FG JR2 3/4 Size Acoustic. It is part of Yamaha’s top-rated FG series. First off, mahogany is one of the most classic guitar woods. It’s a very traditional wood in higher-end instruments but doesn’t tend to show up in cheaper guitars very often. An example is Gibson Les Pauls – these are expensive, really nice, and almost always made of mahogany. Fender guitars, on the other hand, are great, but they are usually less costly, and it’s quite rare for them to contain mahogany. Some people believe that mahogany gives a guitar a warmer, more beautiful tone, and it gives them a richer, more upscale look, thanks to its attractive dark wood grain. If you talk to experienced guitar players about acoustic guitars, one of the first things that always comes up is the finish – thinner is always considered to be better than thicker. The reason is that guitars with thinner finishes tend to vibrate more, which lets more of the pure tone of the wood stand out. It is why the Ultra Thin Finish on the JR2 is more desirable. The JR2 is also available in a Sunburst finish option as well as the natural finish. Since it is an acoustic guitar, the strings are steel, as opposed to the nylon strings that you find on classical guitars. Some guitar teachers prefer to start kids on classical guitars as they are a little easier on the fingers than steel. 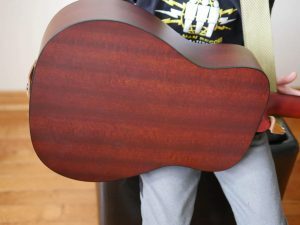 It is a 3/4 size guitar, which means that it is 3/4 the size of a full-sized guitar. The wood on the top is spruce, and the side is nice dark mahogany. 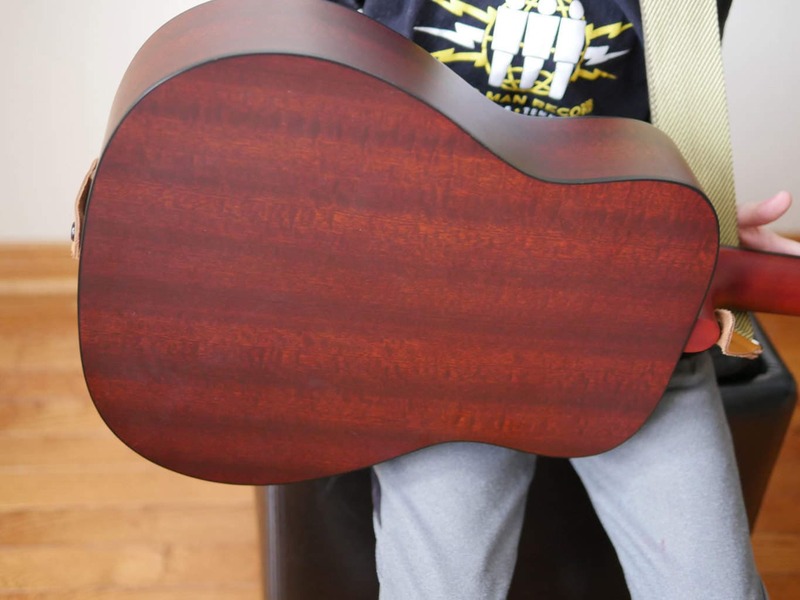 Again, having mahogany in the guitar may not mean a ton to a kid who is just learning, but it’s a nice touch and shows the seriousness that they’ve put into building the guitar. It also means that you might get a little more mileage out of the guitar if your child gets serious about guitar playing and appreciates the quality and looks. The FG2 comes with a perfect looking, durable, padded gig bag. The bag that came with the FG2 I got for my 7-year-old son is brown with backpack straps with a big zippered pocket on top along with a smaller zipper pocket near the neck. Very nice quality bag, so make sure when you buy it that you get one with the bag included – it should be, but you never know. You may not want to get this guitar for kids older than about 11 (depending on the child’s size) since it will probably be too small and there are better options. 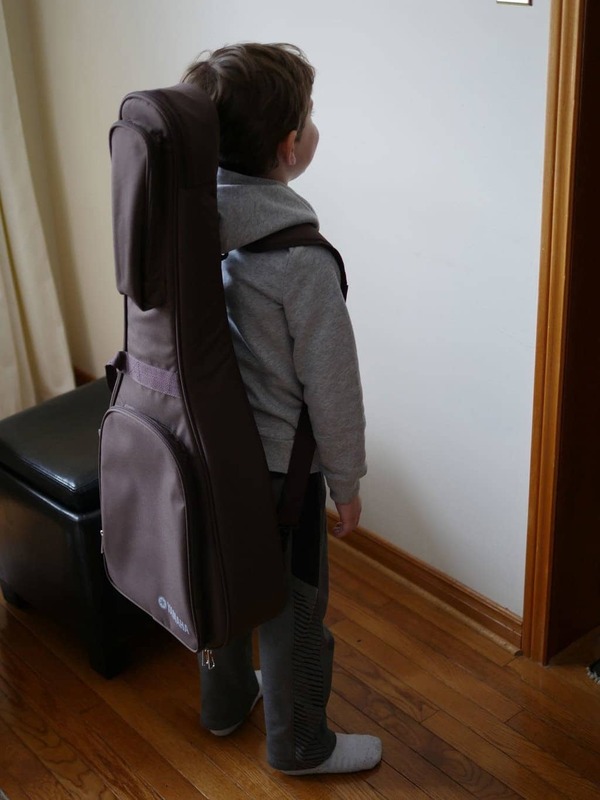 The JR2 is very easy for a child in the 7-11 age range to play because they don’t have to struggle with holding the instrument in the right position and they can get their hands around the slightly smaller neck. Having said that, once your kid is accustomed to the guitar, it should last them longer than that – having a guitar that’s a bit too small is not a big problem. Having a guitar that’s too big – now THAT’s a problem, it makes it harder to play. The guitar chimes nicely from the very lowest notes to the very highest, and the sound is very versatile and will suit any style of playing. 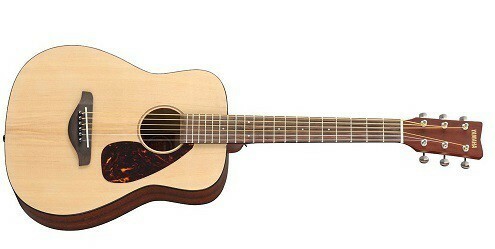 To me, the sound of this guitar is really the prototypical acoustic guitar sound – not too jangly, not too bassy. Don’t get me wrong; it’s great that different guitars have different feels and some are mellow, and some are a bit sharper sounding – this one is just such a good balance. The guitar stays in tune very nicely. 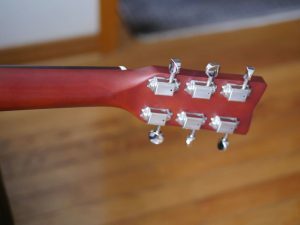 The tuners are clearly good quality – you can feel when you turn them that they aren’t loose, and the gears move smoothly. This guitar requires a minimum of tuning (especially if you keep it in the gig bag when you’re not playing it). With this guitar, you are getting Yamaha’s high quality for a low price. 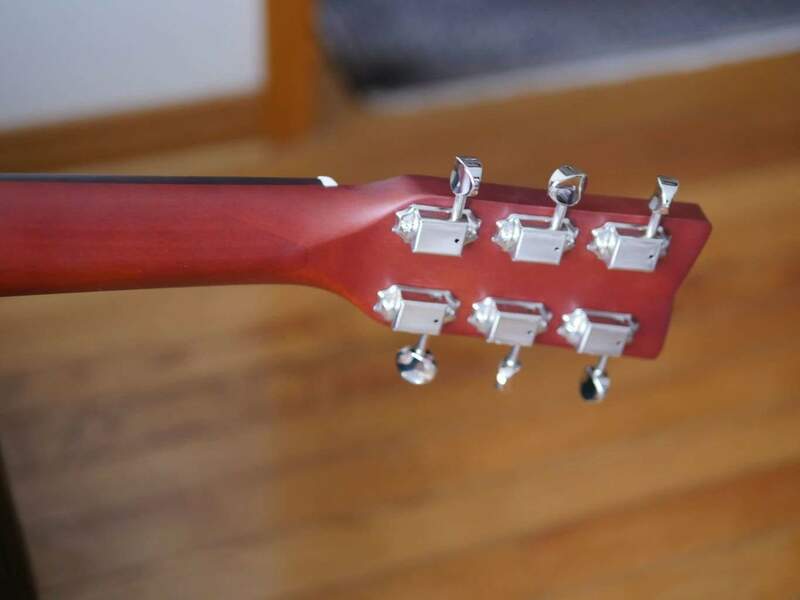 As I mentioned already, the tuners are excellent and turn smoothly so the guitar stays in tune well from one lesson to the next (this can often be an issue with smaller scale guitars). Frets all seem level, the neck is straight, and there is no noticeable fret buzz. If this is your child’s first time playing guitar, you will need to be aware that the strings are steel and anyone who is just learning to play will end up having sore fingers until the fingers start to build up some tolerance to the feel of the strings. It is the same with any steel string guitar, so it’s worth thinking about, but in my experience, kids seem to enjoy guitars more when they’re a steel string. It sounds more like a “real guitar” to them. Almost every acoustic guitar in popular music is a steel string – from Taylor Swift to Shawn Mendes to Neil Young and Bob Marley. For this reason, a kid with a nylon string guitar may not get quite as excited, or go as deep into the instrument. 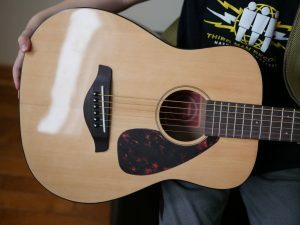 The first time a kid learns to play a few chords to a popular song they know, and it sounds like the actual song – that’s the kind of dopamine rush that can get them really into guitar and keep them practicing and playing for years, so in my opinion, it’s just worth giving them what most people consider a “real” acoustic guitar – a steel string. 1. They have an ages-old brand name they have to protect, so they make sure that even their inexpensive instruments are high quality. They’re not looking to risk the company name, so they take all the guitar-making experience they’ve built up over decades and decades of doing this, and they put it into instruments like these. 2. On the other hand, their brand name isn’t elite when it comes to guitars, so they don’t tack on a big price premium. Yamaha are great, and they’ve been making awesome guitars for so, so long (I’m personally always on the lookout for a nice Yamaha SG-800 from the ’70s, but nobody ever wants to sell theirs). Because they existed first though, Fender and Gibson became the biggest guitar companies way back in the 1950s and 1960s, and Yamaha has never really broken through as a huge name, which means they have to work a little bit harder and charge a little bit less. They can’t just say “Hey we’re such hot stuff, let’s add another $80 to this price”, and the winner winds up being us, the guitar-buying public. The FG JR2 is an ideal starter guitar for any children ages 7-11 who are serious about learning guitar. It is well made, not overly expensive; it comes with a good quality case that is perfect for kids who are going back and forth between lessons.